I have been waiting for the right time regarding trading crude oil futures. My time has come up. On Friday, February 15 I believe an MACD divergence was completed on the daily time frame. As a result, I will be shorting crude oil at the open today in the afternoon. Unless, prices open dramatically different from Friday's close. I will be posting the details regarding entry price and time later on this evening, as I will be leaving and will not have time to update this page at the market open. Just a word on my other recent trades. I am no longer long gold. I had to exit mid-week last week when my perspective changed rather suddenly. Fortunately, I was already long gone out of gold before Friday's 25-30 point decline. Also, my British pound futures trade was a bust. I did make a successful short-term short trade in natural gas on Friday that scored me 4 points. As of now, this short crude oil trading is going to be my only open position. I'll talk more about some other trades I'm considering at the end of the page. Let us observe a daily crude oil price chart. The chart is for the May contract, and is from barchart.com. What we see here is an MACD divergence. The divergence could be considered complete, because we see a downtick in the last bar of the MACD histogram. This is my cue to enter into the trade. Let us now observe a 60 minute oil futures chart to see the precise entry point for this short oil futures trade. We see here prices making a low in the 96.30 range. We then see prices creep up towards 97.00 over the later part of the day, and finally the last trade for the May contract was at 97.11. We saw the new lows, and a slight regression. I plan on shorting on this, which I believe to be temporary, upward pullback in prices. I am anticipating further downward price movement over the course of the following week and weeks. As always, I am using a stop loss order to minimize my exposure to potential losses if my analysis turns out to be wrong, or in case of dramatic market moving events. 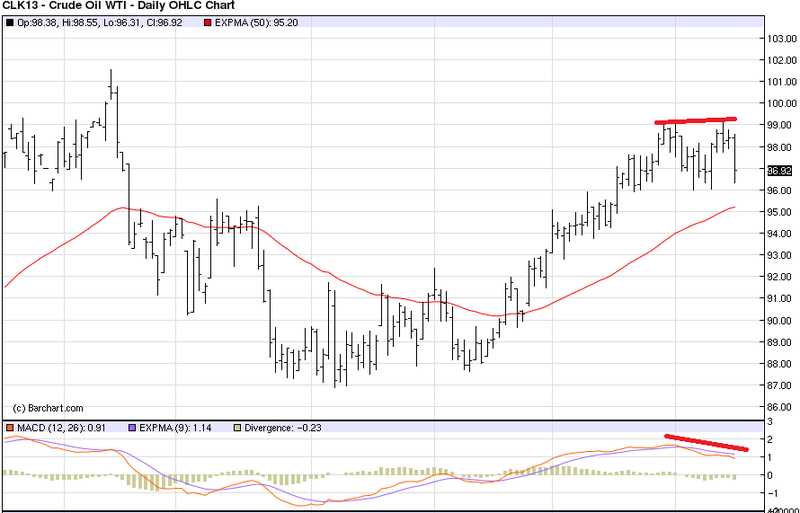 I am hoping for a price decrease to below 90.00, and perhaps even below 85.00. I will be posting updates in this futures blog regarding this exercise in trading crude oil futures. I am considering taking long positions in cocoa, sugar, and cotton. However, I am not in a decision mode yet. I am, rather, just watching with a bullish bias looking to see if a buying opportunity that I like arises. I am also considering a shorter term short trade in corn, but this trade still has to show a setup which I am anticipating may occur this week. We will see, it may not occur the way I like, or it may occur and I may just not trade it.